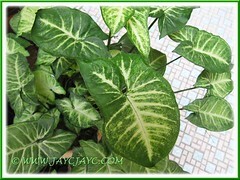 We just love variegated foliage plants. These are one of those plants where the leaves are attractively patterned in various lovely colourful shades that make them as desirable to have in any garden, outdoors. And you can even grow them indoor as houseplants. A pot of Syngonium podophyllum ‘Pixie’, a compact and bushy cultivar with smaller leaves that are variably shaded in green with creamy white markings, and costing RM13.00, was added to our garden in September 2011. We had propagated further into 3 pots now. Just fantastic as they’re easily multiplied and you’re guaranteed of their existence for life in your garden. Yay! Nowadays, you get to see various cultivars or varieties with gorgeous subtle shades of pink and sometimes delicately flushed on the green leaf blades at garden centers. Click this link to Glasshouse Works to enjoy lovely photos of the cultivars available. 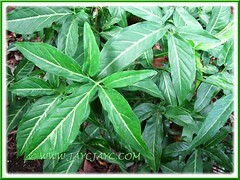 Common Name: Goosefoot Plant, Arrowhead Vine/Plant, Nephthytis, Five-fingers, African/American Evergreen. Etymology: The genus name, Syngonium in Greek means ‘with or together + womb’ referring to the united ovaries. The species epithet podophyllum in New Latin expression, from the Greek expression means foot leaf, referring to its lobed foliage. Origin: Mexico to South America. Plant type: An ornamental evergreen and perennial herbaceous vine. Features: Syngonium podophyllum is an impressive and popular species of the genus, Syngonium that has about 36 species of flowering plants. This is the most commonly cultivated species with several gorgeous variegated cultivars that can tolerate low to medium light, suited for indoors and offices. It has a medium to fast-growing habit that can reach 2 m or more in height in the wild, but generally about a meter or less as indoor plants. An evergreen perennial vine with variable variegated foliage colours in hues of green, white, cream, yellow and pink. Some leaves can be almost entirely of a single colour too. The leaf shapes are as diverse with some varieties looking similar to arrowhead or goosefoot, hence the common names. Some foliage are heart-shaped and two-lobed, whereas others may have three to five lobes, hence the common name, Five Fingers. Juvenile form of arrowhead-shaped leaves may change as the plant matures, splitting into three to five finger-like sections. A herbaceous vine with leaves held on slender petioles and woody stems that can climb by aerial roots or trail downwards for an alternative attractive display. Similar to plants in the aroid family, it produces flowers too, though rarely, with a white spadix and surrounded by a spathe, that is green on the outside and white in the inside. It has been classified as invasive in certain regions as it spread extensively in the wild because of its root structure. Culture (Care): Syngonium podophyllum grows and multiplies easily with low maintenance. 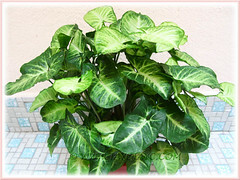 Light: Requires medium or bright light for best growth and attractive foliage variegation but never expose it to direct sunlight that may bleach its leaves. 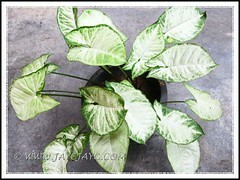 However, it can tolerate low light levels or shade but leaf pattern is less intense as seen in the right image. Moisture: Medium water requirements. Keep the soil moist, allowing the surface to dry out between waterings. 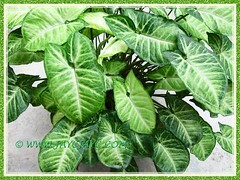 Needs high humidity and misting of leaves regularly if kept indoors. Soil: Grows well in sandy or well-drained garden soils. Others: To keep your plant bushy, just cut off the climbing stems as they develop. Otherwise, allow older stems to climb on a pole, trellis or fence for support. 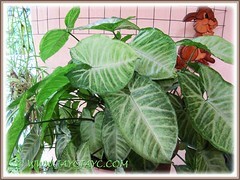 Feed once monthly with a general houseplant fertilizer. When the roots become pot-bound, repot the plant into a pot one size larger to rejuvenate it. Generally it is pest and disease free. Mealybugs, aphids, scale and spider mites can be a problem, so be vigilant and treat it early. Beware that its sap may cause skin irritation or allergic reaction to some individuals. Do wear gloves when handling or pruning the plant if you’re prone to skin rashes. Besides, it contains calcium oxalate crystals, hence all parts of the plant are poisonous and can cause severe mouth pain if eaten. For subtropical and temperate regions: Hardiness: USDA Zone 10-12. Best to overwinter indoors in winter. During winter when the temperature is lower, best to reduce watering, and when the temperature increases, you need to increase humidity by misting the plant regularly or place the pot on a shallow tray of pebbles filled with water to just below the base of the pot. Fertilize once fortnightly in summer but once monthly in winter if it is not resting and showing signs of growth. Propagation: By herbaceous tip or stem cuttings that can be rooted easily in soil or water. Easier by dividing its root ball. 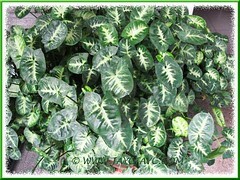 Usage: Syngonium podophyllum or Arrowhead Plant with such lovely variable variegation on their foliage will be ideal to display it alongside a group of other foliage plants. For additional interest, you can grow it in a hanging basket or potted and placed on a high metal stand, to allow the plant to trail downwards when it ages and become vine-like. Another alternative that is aesthetically pleasing is to train it to climb on a pole, trellis or fence for support. 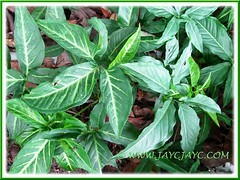 Arrowhead Plant can also be used as a ground cover plant in garden borders. 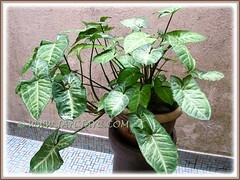 It can be grown outdoors or indoor as a houseplant and ideal too for interiorscape in shopping malls, offices, etc. 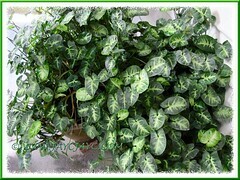 It’s also a great decorative houseplant to clean or purify the air indoors. Enjoy more photos of cultivars/varieties of Syngonium podophyllum. If you know their ID, we’d appreciate if you can inform us in the ‘Comment’ section of this article. A cultivar of Syngonium podophyllum with five-lobed green leaves and central white markings. ID unknown? A cultivar of Syngonium podophyllum with arrowhead-shaped dark green leaves and white markings in the center. ID unknown? Syngonium podophyllum ‘Pixie’, a compact plant with smaller arrowhead-shaped leaves in variable hues of green and white to creamy white veins. A cultivar of Syngonium podophyllum (probable cultivar ID is ‘Ivory’?) 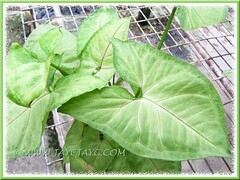 with arrowhead-shaped lemon to yellowish-green leaves and fine greyish veins. I suspect I might have the Pixie variety in my garden. I also got a red tint version too. I had rescued both as someone had uprooted the rootball and thrown them off. The only problem I’m considering is their invasive behaviour – overcrowding other neighbouring plants. I think so, James…. I’ve seen ‘Pixie’ in one of your garden articles. If it’s planted in a pot, it’ll be well-contained, in my humble opinion. You’re truly a great rescuer of unwanted plants and I’m amazed that you have numerous opportunities to add them to your garden. Hello, some time ago we had this potted plant, not to tell what happened to her, at that time I was studying in college, now that I see on your blog I wonder what happened? You have it very neat and beautiful, thanks for the information. You’re most welcome, Yara… thanks for your appreciation and kind comments. I have started growing syngoniums and I’m loving it! Me too, loving its beautiful variegation and ease of propagation that enabled us to share with our friends. Thanks for dropping by, A.Belle. Will surely visit your blog when I’m free, yeah. Root a syngonium leaf that has outstanding color and pattern, over and over again, and over the years you can develop a plant that is uniquely your own. I use Olivia’s Cloning Solution and Super Thrive to keep my syngoniums clonable, even in the dead of our New Hampshire winters. Thank you for sharing your experiences, Starr Morgan!